I spoke to Jaimie at Daugherty Motorsports. We spoke at length. He did not get into specifics about what the Z has because he has not seen the insides of the z900 suspension. He only said that this is a very common KYB fork set up. As to spring rates, he says the Japanese try to pick a spring rate to match most riders and try to make up for the different rates with preload. Which makes sense. I'm sending him my suspension for a rework. He is going to respring the forks and shock for my weight and revalve both ends as well. The total cost will be about the cost for a budget shock alone. As I stated, he built the suspension on my other bike and worked wonders with it. Yes, I'll be receiving my suspension in two days, Wednesday. Then it's going to rain Thursday and Friday, which is good because it will clean the roads of remaining salt. The problem is, my lawn is soggy from the snow melt and I have to cross it from my shed which leaves big muddy groves and foot prints plus I nearly drop my bikes every time. Talk about a kid waiting for Santa to bring him toys, that's me. I weight 185 lbs. Daugherty used .95 springs and a 700 lb/in spring for the shock. He revalved the fork and the shock. Then he used a dyno to preset my suspension settings for my riding conditions, which I told him no track days just back road bombing. He told me not to touch the settings for the first few rides. (He did this on my other bike and I never had to touch them). Pretty much all he asks when you initially talk to him over the phone is..how much you weigh and are you racing on the track. Then he says "so you won't be coming off a 100+ mph straight hard braking into a corner?" I told him, no. Then he says, ok, I know what you need. Easy. The total cost shipped back is $655. I had to pay shipping to him. So total cost was slightly under 700. I'll post up my riding impression when I get to ride. Hopefully Sunday. About how long did the whole process take? Super stoked to hear your first impressions and review!! It probably took a month. It depends how busy he is. I think he gets really busy in the spring. The suspension arrived today. It looks good. No tooling marks and a nice dark blue Hyper Pro spring on the back. I took the left fork and pressed it up and down on the shed floor, holy moly there is actually some rebound damping. I'll get it all installed by tomorrow but due to rain causing a mud hole in my yard I won't be able to ride it until next week. The suspension arrived today. a nice dark blue Hyper Pro spring on the back. Would I be right assuming the Hyperpro rear is a dual-rate (marketed as 'progressive') spring? Any picture I've seen of a Hyerpro it has always been a dual-rate spring (front and back). Example of a dual-rate spring (one group of coils a different width apart to others). 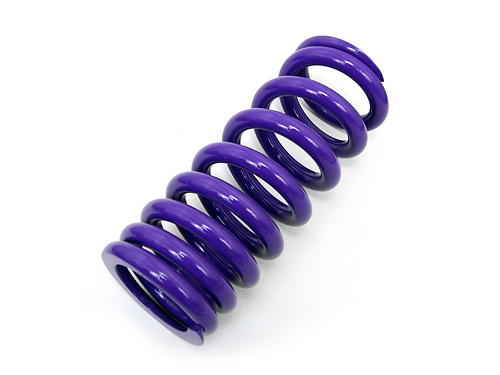 A true progressive spring has no two coils the same width apart. EDIT...I take that back. 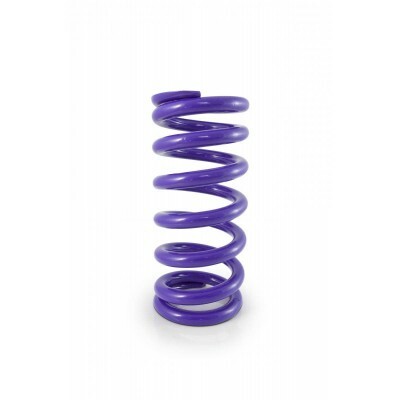 According to their website, they make 'rising rate' springs. It certainly appears to be straight however. I'm not sure what he used in the forks.